I have returned! Not really. Mmfgh that took a while. Goodbye, French project. Hello, Nia. Yeah. 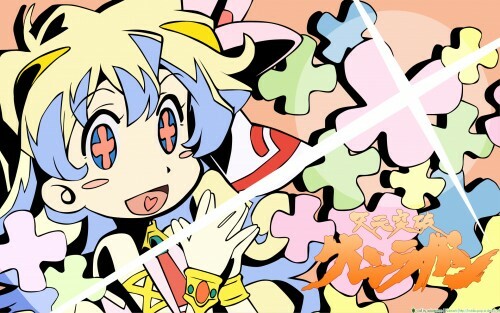 I adore TTGL, especially its awesome commercial break filler artwork. It's done in a very cool, visually-pleasant style; I have another screenshot I want to vector too, but that one will take much more time than this one, since this one's just really me slipping back into my vectoring shell. Its been a while since I've done a substantial vector work; I'd almost forgotten how much I hate lineart, and how much I love working with the pen tool and all its absurdities. The screenshot's from episode 10, for all those who care to know. Everything Chloe said & more! The vibrant colours & the energetic emotion are just fantastic! Nice job! the colors are kawaii! LOL NIA IS SO CUTE !